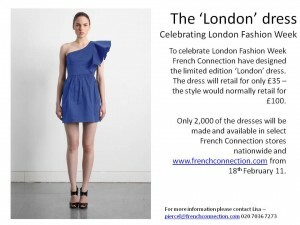 To celebrate London Fashion Week, which kicks off on Friday 18th February, French Connection have launched a limited edition ‘London’ dress. It’s the ultimate in feminine fashion, with a short hem line and a frilly asymetric shoulder feature. 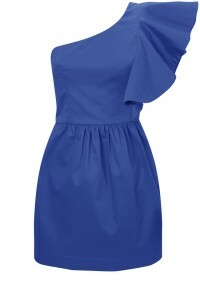 In a beautiful shade of blue, this dress should retail at £100, but is selling at £30 to celebrate London Fashion Week. Team with platform shoes and a luxury shoulder bag and your head to toe in LFW style!